January 31, 2012 -- Amsterdam -- ISE -- Phoenix Audio Technologies, a global leader in high definition audio communications, announces the release of its latest generation of Quattros, the Quattro3 (or Q3) family. "Continuing the tradition of the highly successful Quattro series of conference phones, we at Phoenix Audio Technologies are very excited to introduce the new Quattro3 for your desktop or conference room. The Q3 is one of the most technologically advanced table top conference speakerphones out there and offers its users a unique and complete solution for any size room they may have," states Jonathan Boaz, Vice President of Sales and Marketing for Phoenix Audio Technologies. The Quattro3 has improved in many aspects including performance, design, expandability, flexibility, and functionality. A new and more powerful DSP allows for crystal clear, full duplex, true High Definition audio. The Q3 has a bandwidth of 16KHz with 32KHz sampling rate and executes improved and more aggressive algorithms to deal with large and reverberant rooms. The new design has conveniently relocated all of the Q3's connectors under the unit to allow for a more discrete cable connection. Even more exciting is that all Quattro3 models are daisy chainable and can be powered from a single source, using a standard Ethernet cable. No more proprietary cables. No more designated units. The new modular interface design makes the Q3 the first conference speakerphone that can adapt to changes in an office, eliminating the need to replace units as voice communication systems migrate to different technologies. But perhaps one of the most noticeable differences in the Q3 is the new built-in dialer and LCD panel. This integrated dialer replaces the old (and optional) external dialer and is a standard part of both the PSTN and IP phone interfaces. 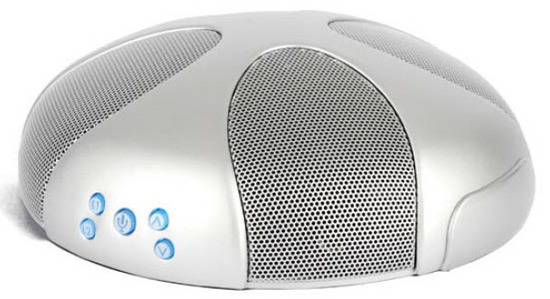 It will provide the office environment with a long awaited standalone conference room speakerphone solution. While many improvements have been made the core concepts behind the Quattro3's predecessors have been maintained. The size and shape of the Quattro3 is still small and elegant using the same outer shell as the Quattro2. The materials used are still aluminum die-cast, which add a professional and durable feel to the product. The Q3 is still the only product that utilizes a four microphone beamforming array, proprietary multistage split echo canceling, and advanced frequency and time domain noise canceling algorithms. In-unit controls, connectivity, and 3-way interface bridging capabilities have been passed onto the new generation as well. Pre-orders of the new Quattro3 have already started shipping and current orders are expected to go out between the middle to end of February 2012. For additional information please contact Phoenix Audio Technologies at [email protected] or call (818) 937-4774. January 31, 2012 -- Amsterdam -- ISE -- Phoenix Audio Technologies, a global leader in high definition audio communications, announces the release of its latest generation of Quattros, the Quattro3 (or Q3) family. \"Continuing the tradition of the highly successful Quattro series of conference phones, we at Phoenix Audio Technologies are very excited to introduce the new Quattro3 for your desktop or conference room. The Q3 is one of the most technologically advanced table top conference speakerphones out there and offers its users a unique and complete solution for any size room they may have,\" states Jonathan Boaz, Vice President of Sales and Marketing for Phoenix Audio Technologies.